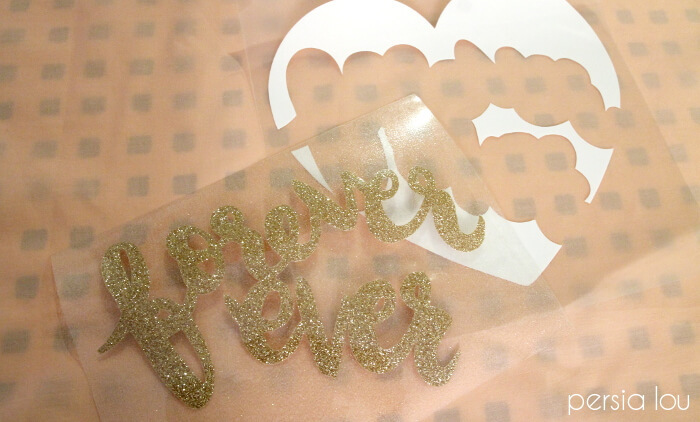 Make your own adorable Valentine’s Day projects with this free hand lettered “Forever Ever” SVG Cut File. 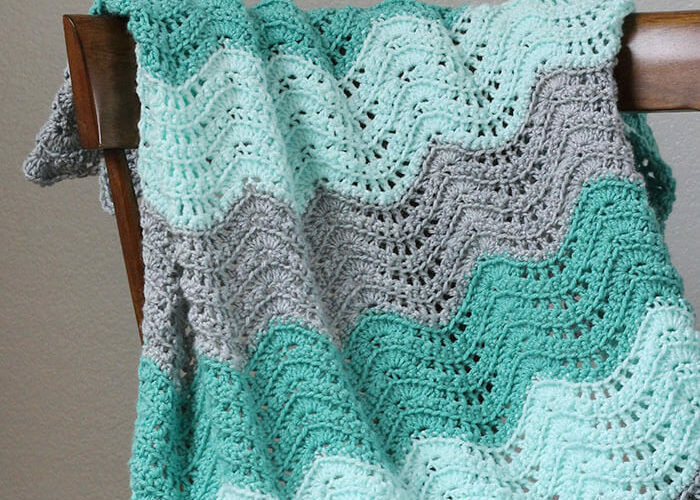 This post was originally made by me for Craftaholics Anonymous, and it contains affiliate links, which provide me with a small commission at no extra cost to you. Thanks! I don’t know about you guys, but it seems like I am in pretty near constant need of new throw pillows. 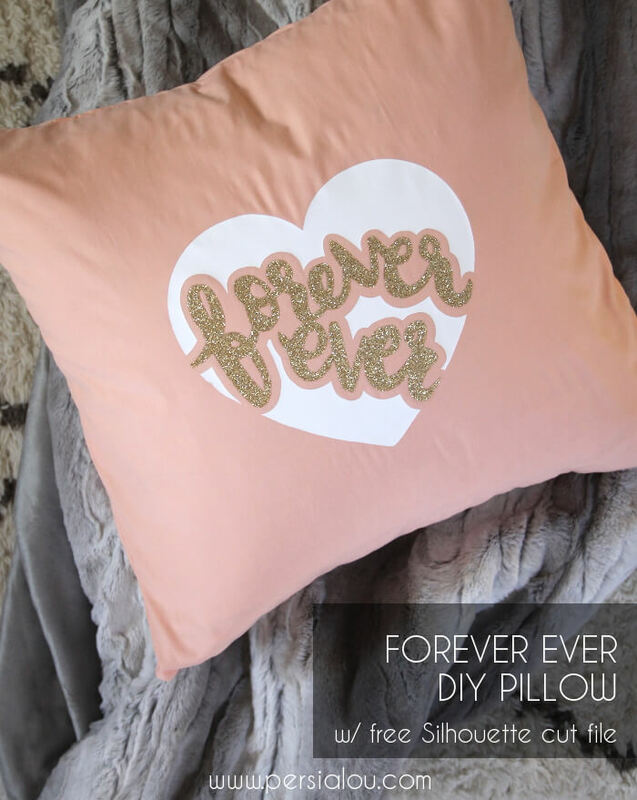 Our pillows get a lot of napping, throwing, and fort-building love, so they regularly need a refresh. 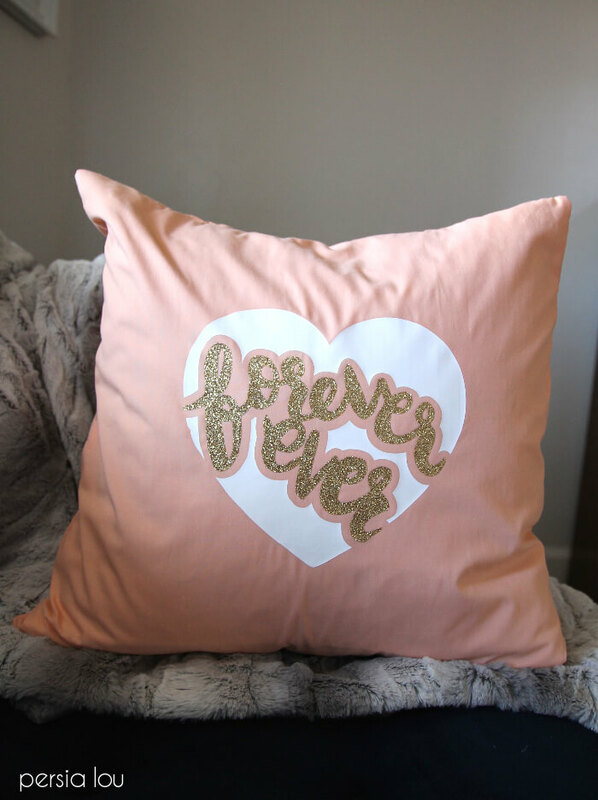 The good news is pillow covers are easy to whip up, and today I have a super cute DIY pillow cover for you all that involves hearts and love and a peachy pink so that totally = Valentine’s Day. Look at me, crafting for the seasons and what not. But, this guy will be hanging out long past V Day because love is for all seasons, friends. Love is for all. Oh and – hey – since I made this pillow using iron on heat transfer vinyl and my Silhouette Cameo it took less than an hour to make. Quick and easy for the win! 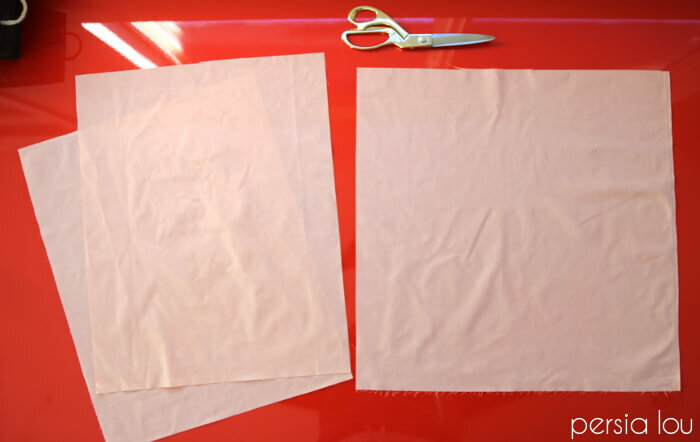 Begin by cutting your fabric. You will need three pieces – one square for the pillow front and two rectangles for the back. My pillow form was 19″ so my pieces were cut to 20″ x 20″ and 20″ x 16″. For a 16″ pillow form, you will need a 17″ x 17″ square and two 17″ x 13″ rectangles. Next we will cut, weed, and apply the vinyl to the pillow front. Start by downloading my forever ever heart design and opening it in Silhouette Studio. The file is already mirrored and ready to be cut out of heat transfer vinyl. If you are cutting the design all out of one color, just go ahead and cut the design and weed out the negative space (and – sneak peek! – scroll to the bottom of this post to see what it looks like in all black). 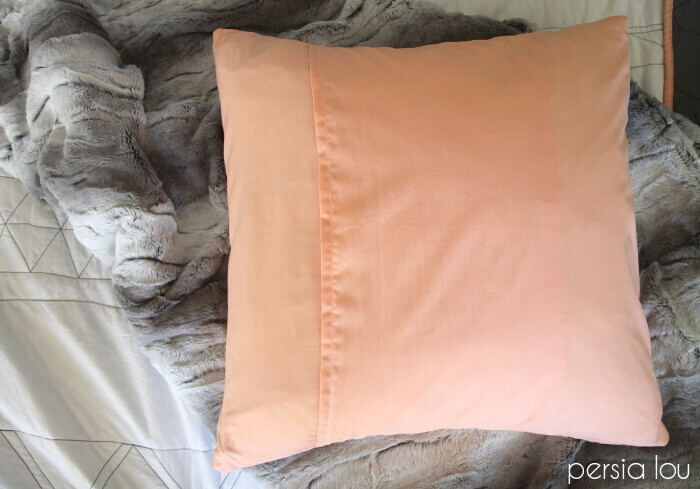 If you want to cut the design out of two colors like I did on my pillow, you will need to do two separate cuts. Click on the sections you do NOT want to cut and then select “No Cut” before cutting. Then, go back and switch it to the opposite before cutting the next piece. 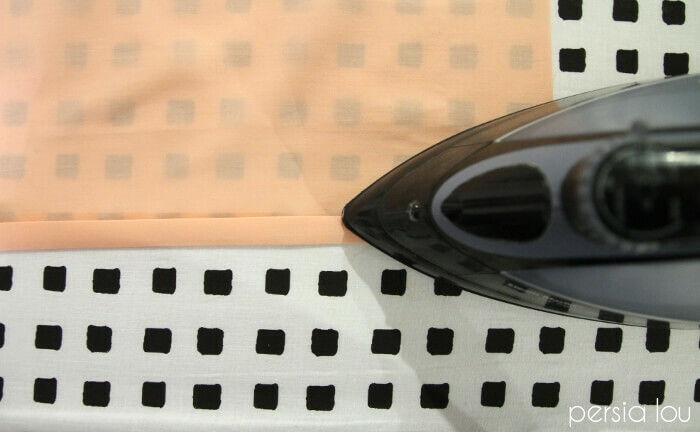 Grab your square pillow front, and let’s adhere that vinyl! To find the center of the square, fold it in half one way and then the other. Give the center fold a quick finger press, and unfold. 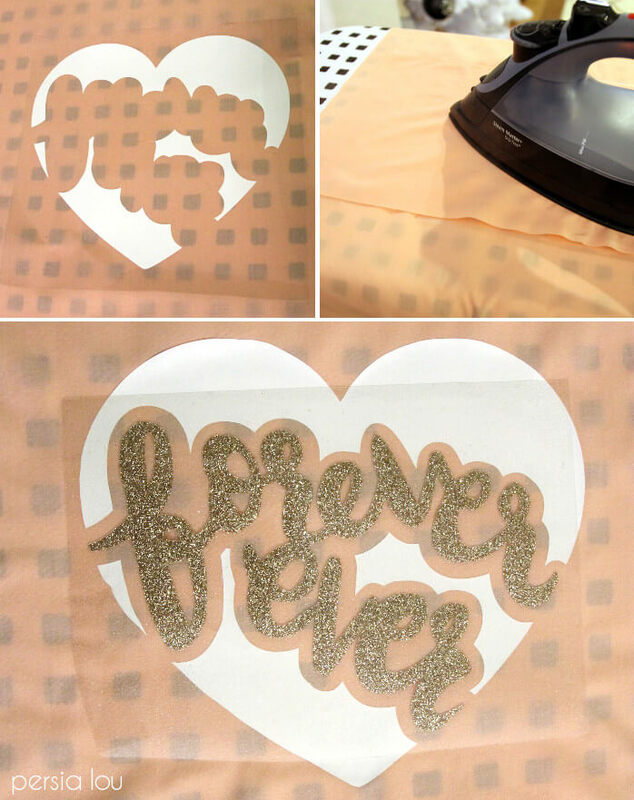 Center the heart shape over the center mark, cover with a scrap piece of fabric and firmly press for 45-60 seconds. Remove the plastic, and you will see your cute heart shape! 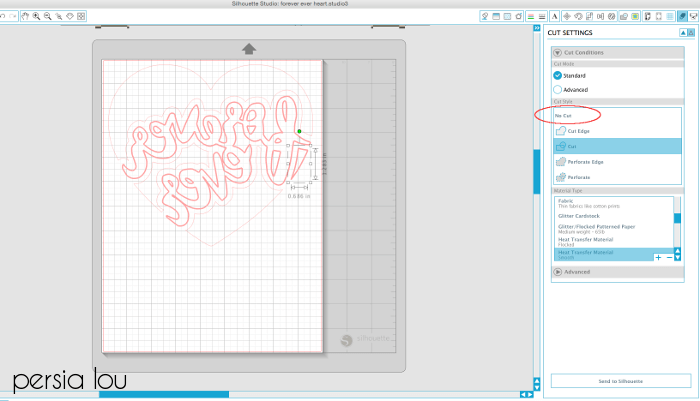 Now, line the lettering up, so it fits into the heart, and repeat the pressing process. Our pillow front is all done! 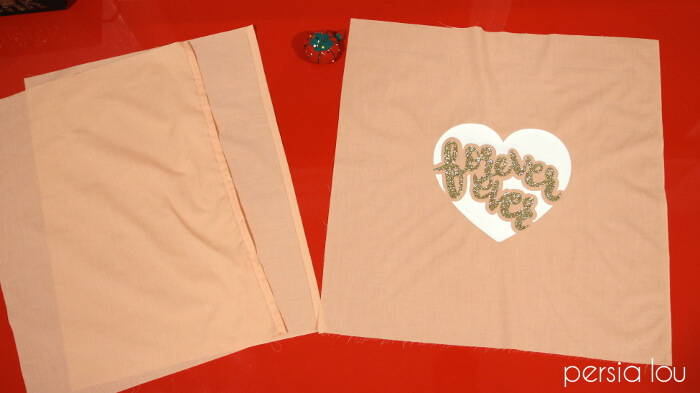 Stitch over the top of the pieces you pressed to create the hems of on the pillow back. 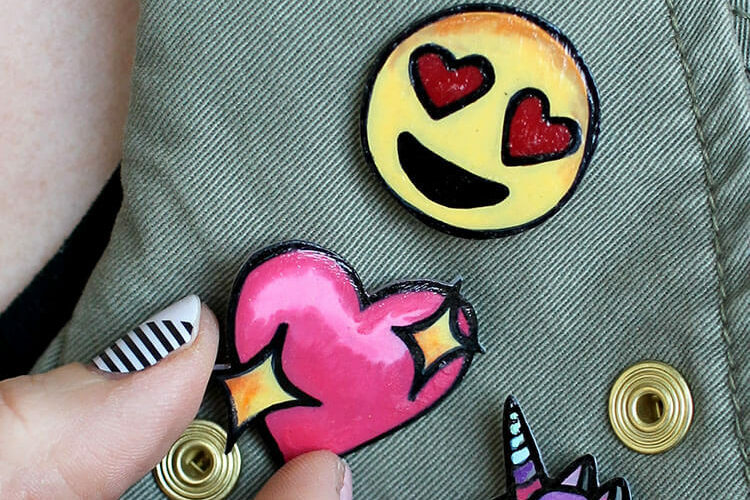 Now your pieces are nearly ready to sew together. Layer the back rectangles so they overlap in the middle and form a 20″ x 20″ square. Pin the pieces together so they remain in that shape. Finally, pin the pillow front to the back with right sides facing each other. 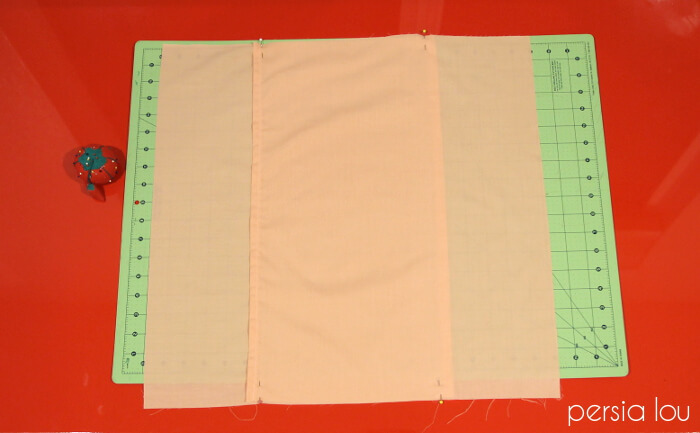 Sew around the entire outer edge of your square leaving about a 1/2″ seam allowance. Flip your pillow cover inside out, and stuff in the pillow form. Et voila! Adorbs new pillow. It looks pretty sweet sitting on our new sofa. 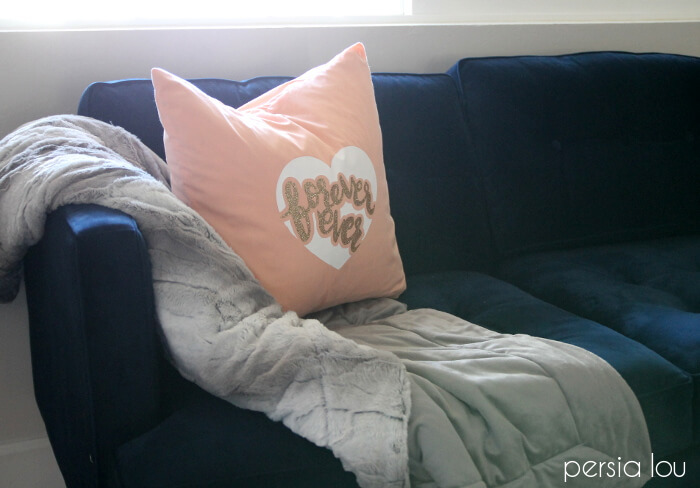 Can a person love a loveseat? I mean it’s a loveseat, right? So here’s the thing. This was the first time I designed a Silhouette project that I hand-lettered, and I really just loved the way it turned out. So I couldn’t just use it once and be done. 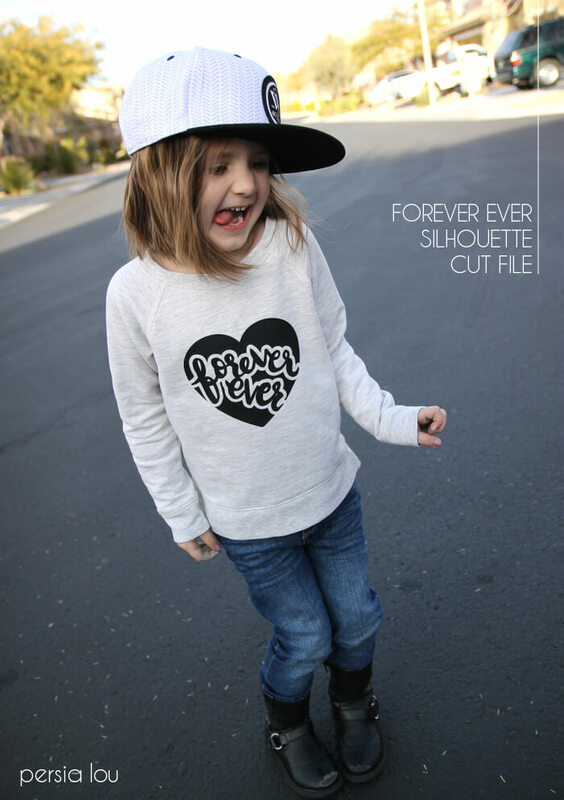 I cut it out of black vinyl and ironed it on to a sweatshirt for my little girl too. 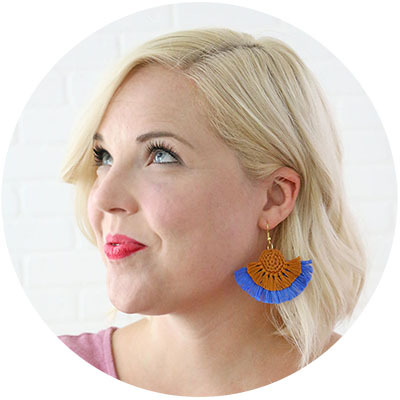 She loves “styles” – which is how she describes fashion and clothing. Love her. Are Mommy and Me sweatshirts cool or no? Eek! This is SO adorable. And I just got my first roll of gold foil heat transfer material so I&#39;m ready to party!